Online sale of pets: What’s the cost? The EU Dog & Cat Alliance and its member Blue Cross have unveiled a new report into the damaging consequences of the online sale of animals in Europe, during an event at the European Parliament. 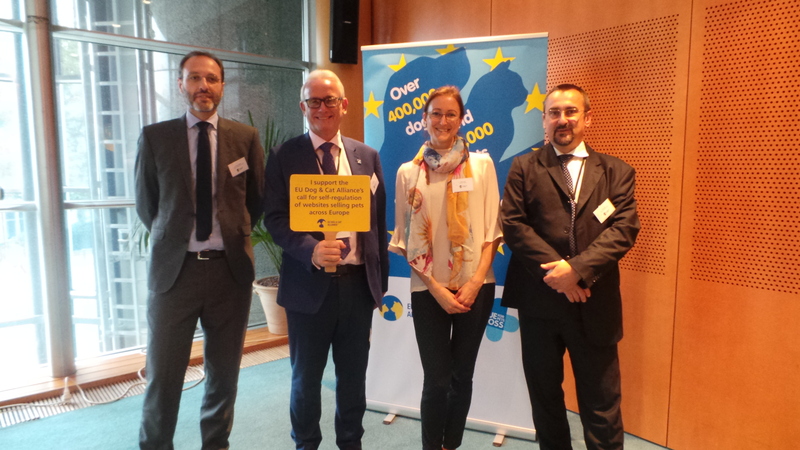 Hosted by Mr Pavel Poc MEP, the event highlighted an urgent need to tackle the worrying trend for pets to be sold on unregulated websites to unsuspecting consumers. The report found that over three quarters of EU Member States have hundreds of unregulated websites selling cats, dogs and exotic animals. To address this issue, the EU Dog & Cat Alliance has launched an EU Pet Advertising Advisory Group (EUPAAG), which aims to bring together pet selling websites, animal welfare organisations and relevant government department representatives to agree on a set of voluntary minimum standards and guidelines for advertising pets online. This follows the launch of successful groups in Ireland (IPAAG), Belgium (BelgPAAG) and the UK (PAAG). The Alliance is working towards setting up additional groups across the EU in an effort to promote self-regulation while at the same time looking to collaborate with decision-makers to improve EU and national legislation. The guidelines emphasise to all websites and consumers the importance of questioning the background and breeding history of each animal, for example, to stop them being sold in poor health, for fighting purposes or merely as a fashion accessory that is later abandoned because consumers are unaware of how they have been bred and cared for prior to being sold. The guidelines also include requirements for all adverts to display the age of the animal advertised, and, among other guidelines, permanently ban vendors who attempt to post adverts that fall foul of the EUPAAG minimum standards. “This report shows an urgent need for action. Our report found over 400,000 adverts for dogs, 100,000 for cats and thousands more for exotic animals in the 21 Member States we looked at. In some countries, where no regulations exist, animals are being sold on with no thoughts to welfare at all. This poses a risk not only to the health of the animals, but it also becomes a question of public health and consumer protection. In the run-up to the event, the Alliance ran a Twitter contest to raise awareness of the report, asking MEPs and EU officials to tweet a selfie of their four-legged friend and win a hamper for a companion animal welfare charity in any EU country. The winning image was submitted by Marlene Mizzi MEP and her cat.